The USASF Scholarship Fund was established in 2008 thanks to the help of our generous sponsors. This scholarship was designed to recognize and reward outstanding All Star Athletes by providing financial assistance to further their college education. This scholarship is open to any college-bound senior that participates with any USASF member program. In addition, applicant must be a USASF Member Athlete. Essay of 300 words or less (requirements below). Head shot photo of good quality that can be used in print. Completed USASF Recommendation Form from your All Star Coach. Completed USASF Recommendation Form from your All Star program owner/director. Click below to read the instructions and complete the online form. All finalists will be required to attend a final interview at The Cheerleading and Dance World Championship, which will determine the placement of the applicants. THE INTERVIEW WILL TAKE PLACE THE FRIDAY OF WORLDS, April 26, 2019, from noon until 4:30pm at Coronado Springs Resort. Please book your flight accordingly as you MUST be interview-ready at this time. It is applicant's responsibility to have transportation to the interview. If you find you are unable to do so, please contact Gena Evans immediately for help, as the interview is mandatory. Scholarship applications must be completed online by February 1, 2019 and videos must be submitted no later than February 8, 2019. NO applications or performance videos will be accepted after the deadline so please apply early. All applicants will be notified by March 20, 2019. Finalists will be presented at one of the awards ceremonies at Worlds. It will be a formal affair; cocktail attire is suggested. Duration of the scholarship will be one year. Funds are sent to recipient's College/University to be used for any reasonable cost related to working on a degree. Be sure to keep a copy of your application, essay and performance video as a backup. ESSAY MUST BE TYPED IN MICROSOFT WORD and uploaded during your online application process. You must address FIVE bullet points listed below in 300 words or less as one cohesive essay. Why are you going to College/University? How has your participation in All Star helped your personal development? How do you plan to give back to your community after completing your education? 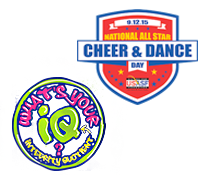 How have you helped promote good sportsmanship in All Star? What specifically makes you a good role model? List the three biggest challenges to image of cheer or dance in our society. Formulate a three-step program for improving the image of cheer or dance nationwide that you would recommend to All Star leaders. List several suggestions you feel could help improve the All Star. Describe any unusual challenges or financial hardships you face in continuing your education. CHEER AND DANCE PERFORMANCE VIDEOS must be completely non-descript (Must wear generic clothing, background must be completely generic and may not include any program names, logos, trophies or banners in the background). Failure to do so is subject to disqualification. Your video can be created any way you choose, but using your phone or tablet is the most simplified option. Be sure to hold your camera or tablet horizontally for best results. DETAILED INSTRUCTIONS FOR UPLOADING YOUR VIDEO SUBMISSION WILL BE SENT TO YOUR EMAIL ONCE YOUR APPLICATION HAS BEEN RECEIVED. IT IS YOUR RESPONSIBILITY TO CONTACT GENA EVANS AT gevans@usasf.net. IF YOU HAVE NOT RECEIVED VIDEO INSTRUCTIONS WITHIN 24 HOURS OF APPLICATION SUBMISSION. Please DO NOT introduce yourself with your name or your program affiliation in either spoken words or on-screen text. This is a SOLO Performance. You are the only person allowed in your video. Must include tumbling (within legal USASF guidelines). No trampoline/rod strip/tumble tramp, etc. tumbling will be judged. Only skills performed on a standard spring floor will be judged. No stunting of any kind will be judged. Must be no more than 90 seconds in length. Please DO NOT introduce yourself with your name or your program affiliation in either spoken words or on- screen text. Requirements: A solo performance showing the full range of abilities of the dancer. The routine may include (but not required to include) more than one style of dance and should incorporate the technical skills and expression/emotion appropriate to the chosen style(s). YOUR ACCEPTANCE AS AN APPLICANT OF THE USASF COLLEGE SCHOLARSHIP PROGRAM.